The usually reserved Patrick Khodorenko isn’t all business 24/7. Robby Jackson, a longtime friend and former teammate with the Oakland Bears, Santa Clara Blackhawks and LA Selects, takes it a step further. What NHL scouts see is a highly skilled, strong and explosive player. Even though he isn’t eligible to be selected in the NHL Entry Draft until 2017, he’s on scouts’ radar. A late 1998 birth year, the 6-foot, 197-pound Khodorenko is in his second season with the NTDP. “He’s very strong and is a deceptive skater; when we do our testing, he’s one of our fastest guys in short bursts,” Cole said. “Offensively, he has a lot of talent, he sees the ice real well. Khodorenko, from Walnut Creek, developed his hockey skills early through regular workouts with his father, Alex. Jackson skates with Khodorenko at times during the summer, and he played against him last season in the United States Hockey League (USHL) when the Under-17 Team came to play Jackson’s Dubuque Fighting Saints. “He can do it all,” said Jackson, a freshman at St. Cloud State University. “He has an effortless stride and great hands, like a young Pavel Datsyuk. There’s so much he can do with the puck it’ll drop your jaw. 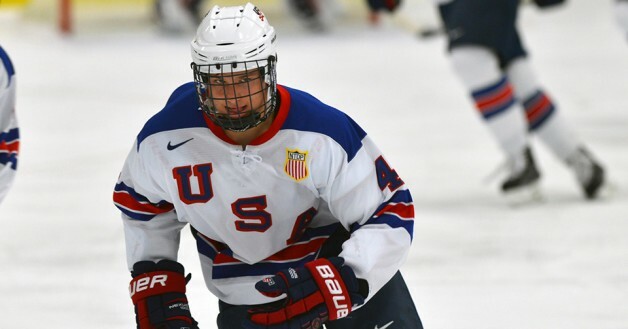 And Khodorenko’s getting bigger thanks to the NTDP’s intense off-ice program, which he said has prepared him well for playing against USHL and NCAA competition. “My biggest gains have come in strength,” he said. “Every week, we’re lifting three times per week. Our training last spring was huge for helping my speed and skill. We worked out every day. Keeping pace wasn’t a problem for Khodorenko growing up. He played in-house, Mites and Squirts for Oakland before spending a year playing Pee Wee AAA with the Anaheim Wildcats under coach Konstantin Lodnia. In Anaheim, he played on a line with Lodnia’s son, Vanya, now with the Erie Otters of the Ontario Hockey League (OHL), and Sasha Chemelovski of the OHL’s Sarnia Sting. “We liked each other a lot and had a lot of fun,” said Khodorenko. From there, he played with Santa Clara’s Bantam AA team that reached the USA Hockey National Championships in 2011 where they fell in the title game. He went on to play one season each for the San Jose Jr. Sharks and the Selects before spending two seasons with HoneyBaked Hockey Club in Detroit, where he won a national championship at Bantam AAA in 2013. Khodorenko said he’s 50-50 on whether he’ll play NCAA Division I next season or head to the Western Hockey League, where he was a second-round Bantam pick of the Everett Silvertips in 2013. Among the schools he’s considering are Boston College and the University of Michigan, Minnesota and Wisconsin.